I have to admit that I would be a pretty bad farmer. My best friend growing up lived on a farm and I helped them pick tobacco one day…yes I said ONE DAY. It was enough for me. Farming is hard work with a lot of risk. Farmers generally take out huge loans and then pay them back when the crops come in. The problem is that things beyond their control can ruin or stunt crops and leave then owing more than they take in. The draw to farming is that it’s a noble profession and you are living on the land. I highly respect farmers. That’s why when I read that there are smartphone apps for farmers… I had to write an article. 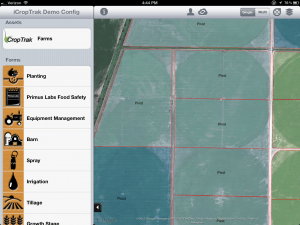 iCropTrak is an iPad app built to help farmers manage their crops from planning to harvest. Your data is stored on a cloud server for easier management. Imagine a multi user system where each member can contribute. Now, I don’t have a farm, but I have researched this app and I’m going to run down some of the main features for you. 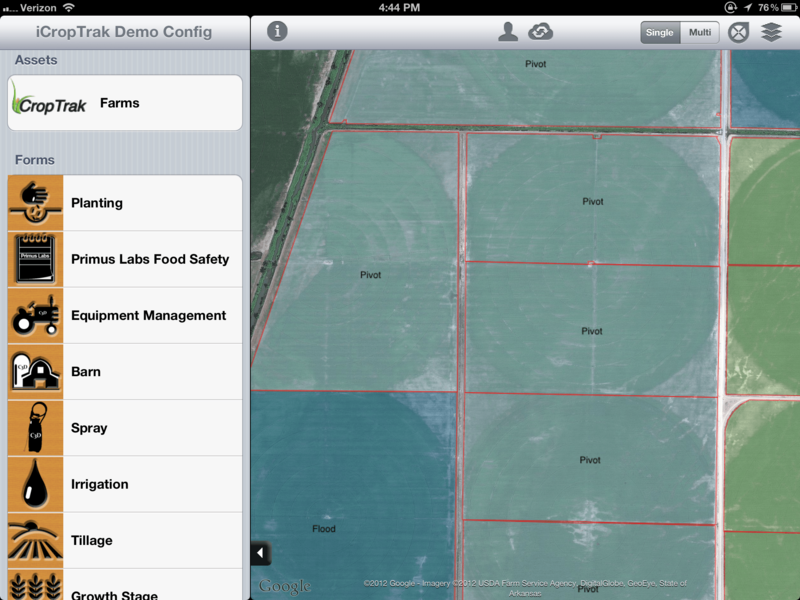 iCropTrak let’s you plan each detail for all of your fields individually. You specify the tasks and budget per field. From here it’s very easy to assign a specific task to a person, group, or even a piece of equipment. Obviously the multi user aspect of iCropTrak is bettter suited to medium to large farm operations. iCropTrak uses zones or grids in relation to field survey tasks such as soil sampling, stalk counting, and quality surveys. 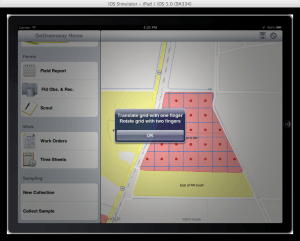 Using the iPad GPS and GIS information you can track the progress of the survey tasks. A nice part of this is the ability to colorize the map based on the results. This gives you the ability to see your progress at a glance. iCropTrak structures your farm like this: Your farms are made up of fields and your fields are made up of zones. You can assign tasks to a zone, a field, or a farm. 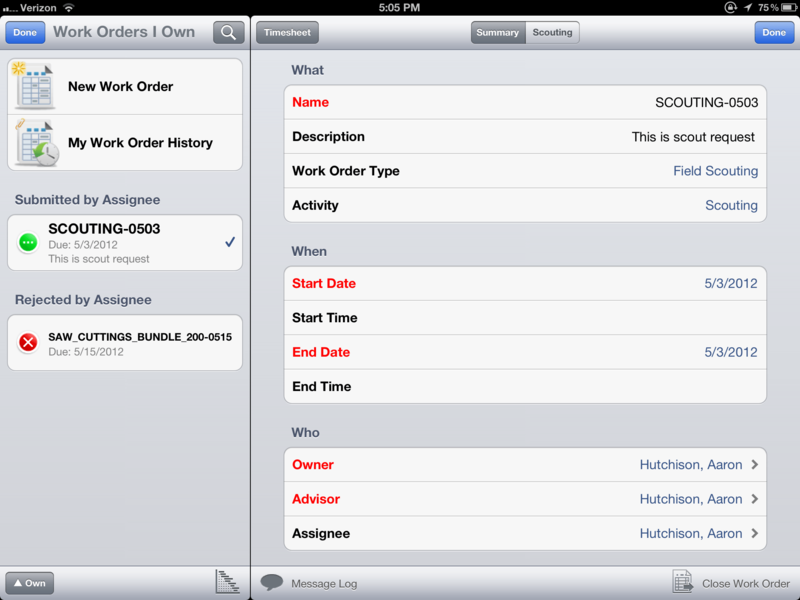 You then can generate work orders for these tasks and assign them to your workers. Let’s say you want to know the progress of a particular work order, you can easily do that using iCropTrak without having to interrupt your employees. You can track when they accepted the job, what progress they have made, and when they have completed the job. iCropTrak uses Amazon Web Services for it’s cloud databases. When you sign up with iCropTrak they set up your own database on AWS. This means you can get to your data anywhere in the world. Security is handled by domain keys ensuring no one can access your data who is not authorized. An aspect of the cloud services I like that the administrator can control the user experience centrally. So if you don’t want your employees to have access to specific features, you can disable access to them centrally. 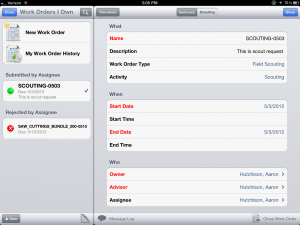 Lastly, the iPad has it’s own local database for those times when you’re in the field and aren’t connected to a network. I’m not a farmer and I would probably never need this application but it is has a very impressive toolset and if you run a farm you should seriously consider looking into it.